House prices and mortgage debt have moved to centre stage in the management of national economies, regional development and neighbourhood change. 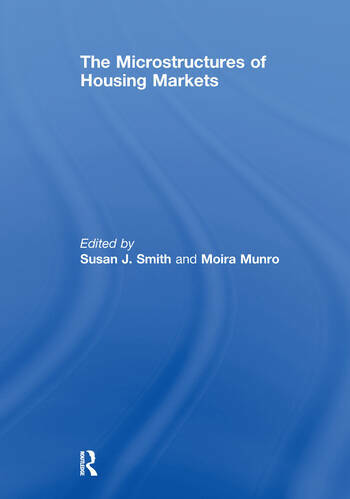 Describing, analysing and understanding how housing markets work within and across these scales of economy and society has never been more urgent. But much more is known about the macro-scales than the microstructures; and about the economic rather than social drivers of housing market dynamics. This book redresses the balance. It shows that housing markets are social, cultural and psychological – as well as economic – affairs. This multidisciplinary approach is helpful in understanding the economic staples of supply, demand, price and information. It also casts new light on the emotional and political economy of markets. Susan J. Smith is Professor of Geography and Director of the Institute of Advanced Study at Durham University, UK. Moira Munro is Professor of Public Policy at the University of Glasgow, UK.